It may sound strange but it is true that the different avatars of Shankukarna worshipped different avatars of Hari. Shankukarna was cursed by Brahma to be born as Prahalada in the Dwapara Yuga. The avatar of Shanku Karna was in the Krutha Yuga. He was cursed to be born as a human being and he did so as Prahalada. Prahalada was the son of Hiranyakashipu and Leelavathi. He was a great devotee of Narasimha, one of the Dashavatars of Hari. Narasimha gave Prahalada his darshana and also killed Hiranyakashipu. Interestingly, there is a cave beneath the YogaNarasimhaTemple in Melkote near Mysore where Prahalada sat in meditation and prayed to Narasimha. This cave is directly beneath the Narasimha shrine of Yoga Narasimha temple which can be approached by a steep flight of stairs. There is a sign that tells visitors and pilgrims about the way to the cave. Though the story of Prahlada is very well known, not many people know that he had an Avesha of Vayu in him. Madhwacharya himself testifies to this in his seminal work, the Mahabharata Tatparya Nirnaya, where he says “hiranyakashipoh putrah prahlado bhagavatpriyah, vayuna cha samavishyto mahabala samanvitah.” . Similarly, Sri Guru Jagannath Dasa, also known as Kosigi Dasa or Jagannatha Vittala (He is not the Jagannatha Dasa who srote Sri Harikathamrutasara) has beautifully described the Prahlada avatara in the second sandhi of Sri RaghavendraVijaya which he wrote. After Prahalada (let us leave aside Bahlika Raja who meets his end at the hands of Bheema-one of the avatars of Hanuma-Bheema and Madhwa in the Kurukshetra war. He sees Bheema and Krishna when his end is nearing and he prays to Bheema that he be allowed to atone for his sins), we come across Vyasaraja who was born as Yathiraja in Bannur near Mysore sometime in 1480. Vyasaraja was a ardent devotee of Krishna and he composed scores of compositions under the ankita Sri Krishna. 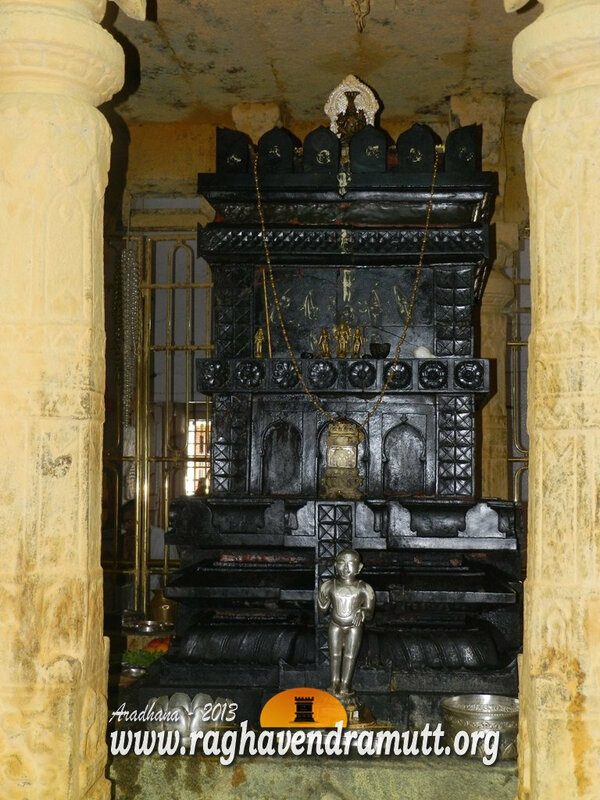 The matha he occupied came to be called Sosale Vyasaraja Matha (this is different from Abbur or Kundapura Vyasaraja Matha) and one of the deities that is worshipped is the dancing Gopalakrishna. The idol of Gopalakrishna belonged to Sripadaraja of Mulabagal and he handed over the beautiful idol to Vyasaraja after he found it dancing to the talas that Vyasaraja made with the saligrama as he was singing devaranamas. This is not to say that Vyasaraja did not worship other Gods. He stayed on in Tirumala for twelve years from 1480 and worshipped Srinivasa. He also consecrated a beautiful idol of Srinivasa in Chennapatna and today this temple is under the management of the Abbur matha. He also consecrated 732 idols of Hanuman and today they are known as Vyasa Prathistha Hanuman. Of the 732 idols, 365 were consecrated in Penukonda, now in Andhra Pradesh. Today, less than a dozen can be seen here as the rest have fallen prey tpo the ravages of time, the greed of man and neglect of our heritage by shortsighted officials and Government. A renowned Madhwa scholar, educationist and philosopher, Vyasaraja never forced the Vijayanagar Kings into giving prominence to Madhwa way of life. He popularised it by his preaching and his philosophy and of course the Vyasa Koota and Dasa Koota that he founded. Even today, his composition, “Krishna Nee Begane Baro”, signals the beginning of dance programmes all over the world and it is integral part of the dance ensemble. Krishna frequently appeared in the dream of Vyasaraja. On one occasion, Krishna appeared in his dream and gently chided him. He said he (Krishna) was a householder. “I have a house, wives and children. Therefore, you have to accord respect to me.” How can you just call me Krishna in your compositions”, he asked. Since then, Vyasaraja wrote under the ankita nama Sri Krishna. In his next avatar as Raghavendra Swamy, he worshipped Rama and Moola Rama Devaru was the Samsthana Vigraha (idol) of the Sri Matha he succeeded after Sudhindra Theertha. As Raghavendra Swamy, we find that he consecrated two idols of Hanuman as against 732 in his previous avatar. If Krishna Nee Begana Baro was popular as Vyasaraja composition, “Indu ennage Govinda ”…. again on Krishna of Udupi was Raghavendra Swamy’s contribution. Today, we find the idol of Narasimha atop the Raghavendra Swamy Brindavana. There are also images of Narayana, Rama, Krishna and Vedavyasa. The image of Prahalada is also near the Brindavana. Hanuman of course is always near the Brindavana. The avatars of Vyasaraja and Raghavendra Swamy is in Kaliyuga. Rayaru himself has indicated that the place where he wanted his Brindavana to be built was the place where he perfomed Yagna as Prahalada.